The best characteristic of President Donald Trump is his willingness to fight. Actually, he doesn’t really fight, he fights back. If someone goes after him, he goes back at them twice as hard. He doesn’t let decorum or politeness get in his way, he gives people a dose of their own medicine. He may not win every battle, but damn it, he fights and wins more than he loses. Republicans need to learn this lesson or just give up now so they can be replaced by people who will. If you pay attention to Donald Trump’s public spats, even dating back to long before he entered politics, he doesn’t strike first. He didn’t wake up one day and decide to call Rosie O’Donnell fat and ugly, he did so in response to her attacking him. If people leave him alone, he leaves them alone. Unfortunately, Republicans, and specifically conservatives, tend to go in the opposite direction. They don’t respond in kind the way Trump does. They have a history of trying to “make nice” with people attacking them, or ignore the attacks completely. There’s something to be said for not punching down, far too many people respond to every criticism against them on social media like it’s an affront to their very lives. They make themselves look smaller in the process, though most aren’t all that bright to begin with. You have to pick your battles. But conservatives have a history of not picking any battles, of taking hits and walking away. That can’t continue to happen. Tucker Carlson is a friend and former boss, I just want to give you the full context here. He’s under attack by the progressive Stasi who demand complete and total capitulation to their will. It’s not over anything he did on his show on Fox News, it’s for jokes he told to a guy named Bubba the Love Sponge more than a decade ago. 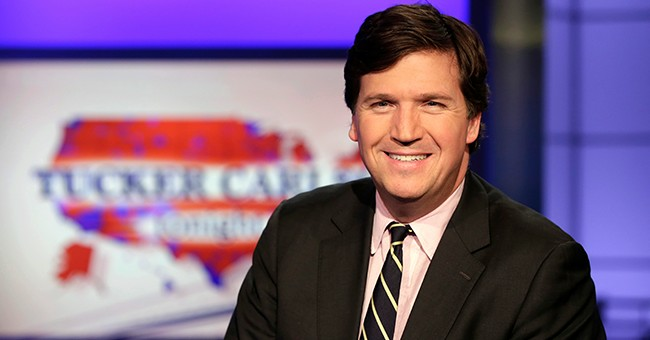 While talking to Bubba on his radio show, Tucker said rude things about just about everyone. They were said in a joking manner because how can you have a serious conversation with anyone who calls themselves that? Clips from those interviews, which he did regularly for years, “resurfaced” through the Stasi group Media Matters. They lead boycotts of everyone in media who does not conform with progressive ideology in an attempt to get people fired and driven out of public life. CNN and MSNBC use their talking points the way they use the Southern Poverty Law Center to label people they don’t like as unacceptable and ruin their lives. Tuesday night CNN dragged out Sam Donaldson to compare Tucker’s jokes to the perverted actions of Matt Lauer and Charlie Rose. “This is vulgarity. This is hate speech. This is homophobic speech. This is the kind of speech, if left unchecked, will change this country forever,” Donaldson told Anderson Cooper. Somehow the country survived just fine in the ensuing 13 years since those words were spoken and Cooper didn’t push back even a little. They aren’t about to let a little thing like the truth stand in the way of claiming a scalp. And if Sam and Anderson were so concerned about virtue signaling and “vulgarity” of people, why’d they let the chief brown shirt leading the charges against Tucker, Media Matters president Angelo Carusone, slide when his own past of slurs and “hate speech” against “trannies,” “jewry” and “Bangladeshis” surfaced? Because he’s on their side, that’s why. They’ve gone after Rush Limbaugh, Sean Hannity, Laura Ingraham, Mark Levin, Glenn Beck, etc. You name the person on the right, this army of flying monkeys has been unleashed on them, multiple times. Each time they are unleashed, damage is done. But no price is extracted for that damage. Conservatives never return the favor of dragging old quotes or actions into the light, they almost uniformly refuse to call for boycotts. They prefer to “take the high road.” What good is the high road if it leads to defeat? Moral victories are just a polite way to justify losing. Liberals collect scalps, conservatives collect moral victories. This isn’t a battle for local dog catcher, it’s a fight for the future of the country; it’s time for the right to fight back the way they’re being attacked. Mutually assured destruction is the only way to stop these fascists in their tracks. It can’t be a shotgun approach of refusing to watch CNN, no one watches CNN now. We have to pick our target carefully – one show, on one network, with one host who lies and smears people for thinking differently. That can be any of them, honestly, but everyone has to be on the same page. Hypothetically, say Chris Cuomo. Nightly, he lies and spins for the party of his governor brother. Who are his advertisers? Pick one, then badger them endlessly that you won’t use their product or service as long as they advertise on his show. Then stick to it, change your behavior and actually boycott them while telling others, on social media and in real life. Lather, rinse, repeat with other sponsors and shows, coordinated, until things change. Find the donors to the groups leading these charges and stop patronizing them, and let them know that’s what you’re doing. It doesn’t matter if it makes you uncomfortable or if you think there should be more speech, not less. They’re coming for you sooner or later, no matter how high your horse. If you won’t fight back when someone on your side is under assault, why would anyone bother to fight back for you? Tucker likely wouldn’t like this, but I don’t seek other people’s permission for my thoughts. These leftists have to be destroyed because they aren’t going to stop, and they don’t face consequences for their anti-American actions. Simply pointing out how bad they are is not enough; they don’t care, they know what they are. It’s time to learn from the success of President Trump and hit back twice as hard. Liberals have to be made to take their own medicine, it’s their own fault it’s a suppository. Please subscribe to Derek’s daily podcast (it’s free!) to keep up to date on everything in the news and pick up a copy of his book, Outrage, INC., which is about how liberals use fear and hatred to manipulate the masses.